Abstract. 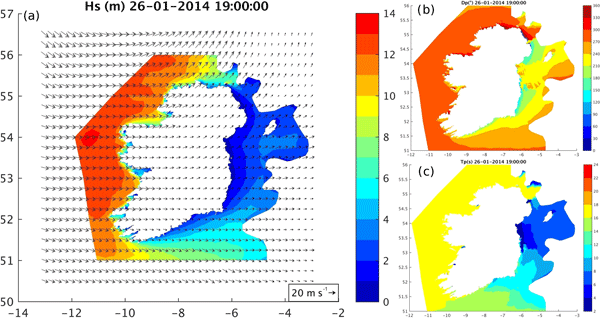 Using the third generation WAVEWATCH III wave model in an unstructured formulation, and driven by HARMONIE-AROME mesoscale model hourly winds with a 2.5km horizontal resolution, we reproduce the winter storms of 2013/2014 and analyse their effect on the western coastline of Ireland. WAVEWATCH III was forced at its ocean boundaries by directional wave spectra obtained from the ECMWF ERA-Interim re-analysis dataset. The wave model has a high resolution grid (up to 225m resolution in the nearshore) with around 20000 nodes, producing an abundance of important wave parameters outputted hourly, enabling a high quality, high-resolution analysis of the winter storms of 2013/2014. 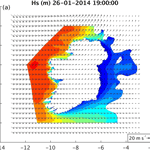 How to cite: Janjić, J., Gallagher, S., and Dias, F.: Case study of the winter 2013/2014 extreme wave events off the west coast of Ireland, Adv. Sci. Res., 15, 145-157, https://doi.org/10.5194/asr-15-145-2018, 2018.